Her grandmother, the indelible Nonna Diamante, believes that Garnet's mystical gift can be traced back to the family's origins in the Nebrodi Mountains of Sicily, and now the Vatican has sent an emissary to Sweetwater to investigate. Garnet, wanting nothing more than to debunk this "gift" and send these desperate souls packing, reaches back into her family's tangled past and unspools for the Church a tale of love triangles on the shores of the Messina Strait; a sad, beautiful maiden's gilded-cage childhood in blueblood Virginia; and the angelic, doomed boy Garnet could not protect. Garnet Ferrari is the object of either extreme prejudice or adoration in her hometown of Sweetwater, West Virginia. To most of the children in town and some of the parents, she is feared and hated because she is different. To the nonnas (Italian grandmothers) and a few others, she is adored for her mystical healing powers. Although Garnet's childhood isn't ideal it is filled with family and love, but all of that quickly changes with one traumatic incident quickly followed by a horrific accident that devastates the entire Ferrari family. 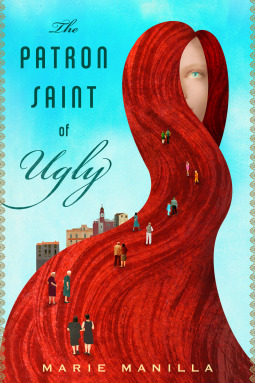 The Patron Saint of Ugly is a fast-paced read about love, survival, and hope. All Garnet, indeed any of the women married into the Ferrari family, want is to be loved. Garnet spends the beginning of her childhood being tortured by the ugly taunts of others. She spends her adolescence and early adulthood striving to be overlooked. It isn't until she returns to Sweetwater as an adult that she seems to overcome the struggle of being perceived as "normal." The Patron Saint of Ugly evoked a lot of responses from me while I was reading: sadness, empathy, sympathy, and laughter. Garnet's nonna was the source of much of that laughter with her machinations during Garnet's childhood and adulthood. Much of the story takes place in either Italy in the early 1920s, West Virginia in the 1950s, early 1960s, and mid 1970s. Ms. Manilla's characters are either extremely lovable or despised. I don't think any reader will like Garnet's grandfather, maternal grandmother, or La Strega (no, I'm not going to tell you who La Strega is . . . read the book). Garnet's story is gradually revealed in a series of taped reminiscences for the Vatican, as she attempts to debunk her so-called healing gifts. It is in these narrations that we learn the back-stories for her nonna and mother, as well as learning about Garnet’s inner longings and desires. If you enjoy reading well-crafted fiction that combines humor, a quest for survival, a longing for normality, mythic origins, and a touch of magic, then The Patron Saint of Ugly is one story you have to read. Disclaimer: I received copies of this book free for review purposes from the author and publisher via NetGalley. I was not paid, required or otherwise obligated to write a positive review. The opinions I have expressed are my own. I am disclosing this in accordance with the Federal Trade Commission's 16 CFR, Part 255: "Guides Concerning the Use of Endorsements and Testimonials in Advertising."